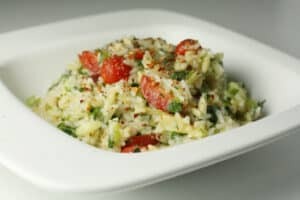 Rice and orzo pasta (pilaf) are mixed with flavorful veggies like scallions, parsley, tomatoes, and cucumbers to make a delicious pasta salad. 1) You can cook the rice and pasta together as I do in the post, but you can also just cook them separately according to the instructions for each and then mix them together. 2) Dice veggies and add them to the pilaf mixture. 3) For dressing, juice a lemon and then whisk in olive oil. Season with salt and pepper and pour dressing over the pilaf and veggie mixture. 4) Season the final salad with salt and pepper and a pinch of red pepper flakes if you want some spice. Adapted from a Body and Soul recipe. This delicious recipe was brought to you by Macheesmo. Read the full post at https://wp.me/pkSYO-3uV.